You must be a piano enthusiast like I am to be interested in this topic. Among the most confusing terms when it comes to this wonderful instrument are electronic keyboard and digital piano. These are two different things but many people do not seem to be able to tell the difference. Do not worry though, I am here to help bring some clarity into the matter. So let’s see what is the difference between a digital piano and an electronic keyboard? Basically, a keyboard is a part of a piano. In an acoustic piano, the board at the top containing black and white keys is the keyboard. The keyboard is not an instrument but a part of another instrument. Keyboards may be part of a digital piano or a synthesizer. A synthesizer generates electric signals which are converted into sound via amplifiers and speakers. It can imitate the sound of many natural sounds including the piano. This is why many people confuse electronic keyboards with synthesizers. Nowadays many people call any instrument that has black and white keys a keyboard. There is no musical instrument called a keyboard. But due to frequent use of the term electronic keyboard can be used to refer to a synthesizer. Even makers of synthesizers nowadays sell them as electronic keyboards. So, nowadays electronic keyboard most often means electronic synthesizer – a device which generates sounds when you press keys. A digital piano, just like synthesizer, is an electronic musical instrument that is played using a keyboard. Unlike acoustic pianos that use hammers and strings to create sound, digital pianos create sound from sampled piano sounds or synthesize an emulation of the piano sound electronically. 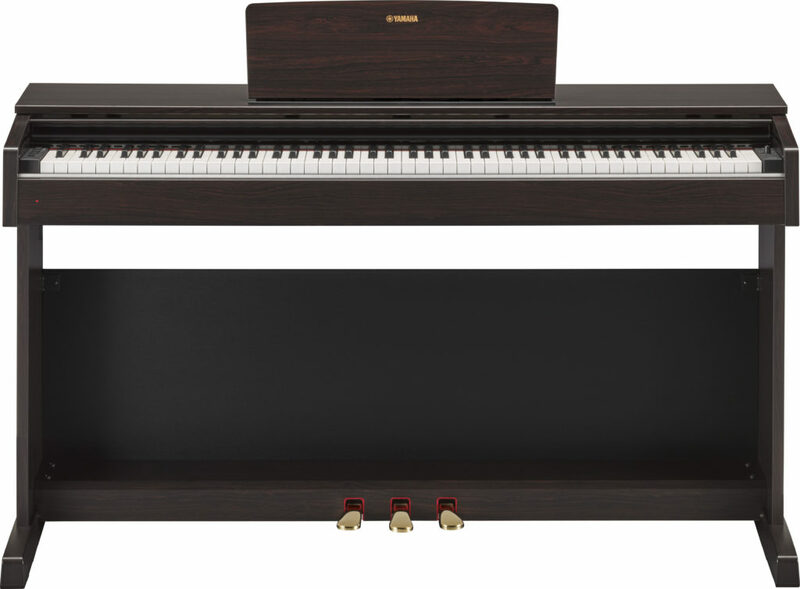 Each brand (Yamaha, Alesis, Williams, Casio, Korg, Kurzweil) has more expensive models, which sound and feel like the actual acoustic pianos but are lighter in weight and occupy less space. How can you know whether an instrument is a digital piano or an electronic keyboard? Both of them synthesize sounds and look similar. Here are some features to look for. You do not need to count all the keys to know how many they are. Just create a picture of a grand piano in your mind and on first look you will know if you are looking at a digital piano or electronic keyboard. Digital pianos have 88 keys with 6 octaves just like there are on acoustic pianos. This way they are able to create sound range just like that of a real piano. On the other hand, electronic keyboards have 61 or 76 keys with 4 to 5 octaves, or sometimes even less. A good digital piano comes with weighted keys whereas an electronic keyboard does not. Weighted keys are made in such a way that they respond to the amount of force applied by the finger pressing on a key. The sound is louder when the key is pressed harder and softer when pressed lightly. The keys are lighter at the top notes and heavier at the bottom. This makes it sound more like an acoustic piano. In synthesizers, the keys are either light- or semi-weighted – they are easier to press, because you most often don’t need the feeling of real piano when you play synthesizer. On digital pianos, the keys are the same size like in an acoustic piano but in an electronic keyboard or synthesizer the keys are often a little smaller in size. This means that electronic keyboards are easier to learn and play while digital pianos take longer and harder to learn. If you are a seasoned pianist like me however you may find it a little difficult to adjust to small size of the synthesizer. Due to the keys being fewer and smaller, synthesizers are smaller than digital pianos. The smaller an item the easier it is to carry it around. This is to say that electronic keyboards are more portable. They are lighter in weight and many musicians carry them from one place to the other. Digital pianos can also be easily moved from one place to the other but not with as much ease as synthesizers can. Digital pianos, as it comes from the name, are mostly created to synthesize piano sound. There shouldn’t be just one sound. There can be a lot of different sounds integrated: bright piano, grand piano, lot’s of electric piano sounds, etc. These are sounds sampled specially for digital pianos. Often there are some other acoustic instruments sounds included such as strings, bass, organ. An electronic keyboard on the other hand has the sounds of a piano and other acoustic instruments as well, but on cheap models they are not as well sampled. Synthesizers however can make much more sounds and tones than pianos. There are many synth tones, some with physical instrument equivalent and others without. Sometimes synthesizers look just like digital pianos – same keyboard, similar control buttons etc. But there is special class of home console digital pianos, which are integrated into wood-like body. They look very beautiful and can be easily integrated into your room design (see Yamaha YDP Series). Prices are very different. You can buy an expensive synthesizer for $2000, or a cheap digital piano for $200, and vice versa. This depends on what you want from your device. If you are serious about playing the piano however, then digital piano is the right instrument to invest in. If you are planning to experiment with sounds or create electronic music – you should look for a good synthesizer. 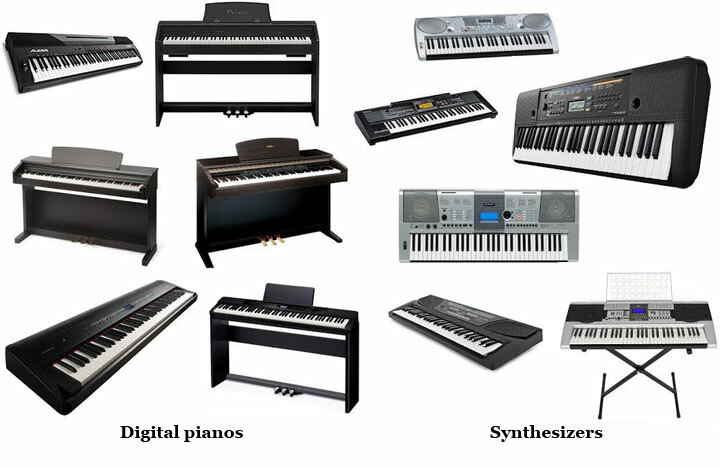 I should say that there are expensive synthesizers (called workstations, for example Yamaha MOXF8, Roland JUNO-DS88, Korg Krome), which have all the features of digital pianos and synthesizers in one body: they have 88 full size fully weighted keys, and have a lot of sounds of both acoustic and electronic instruments. You can also create and upload your own sounds to them, record your tracks, and much more. But these devices are usually expensive and are for professionals. As for me, I recommend that my younger students start to learn on digital pianos from the very beginning. This way they can be sure that if they play on a grand acoustic piano some day, they won’t be confused too much of all that things I described – the number, size, and weight of keys, as their training instrument has similar specifications. your blog provided helpful information for beginners like Price, appearance, number of keys in the keyboard etc. Thanks for such a great description of Digital piano and keyboard.